For many restaurants, the need to differentiate your business from the competition is absolutely essential. 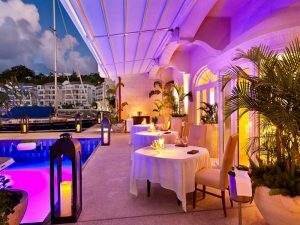 Comfortable outdoor seating areas have proven to be one of the most effective ways to stand out for new customers and create memorable dining experiences for returning ones. 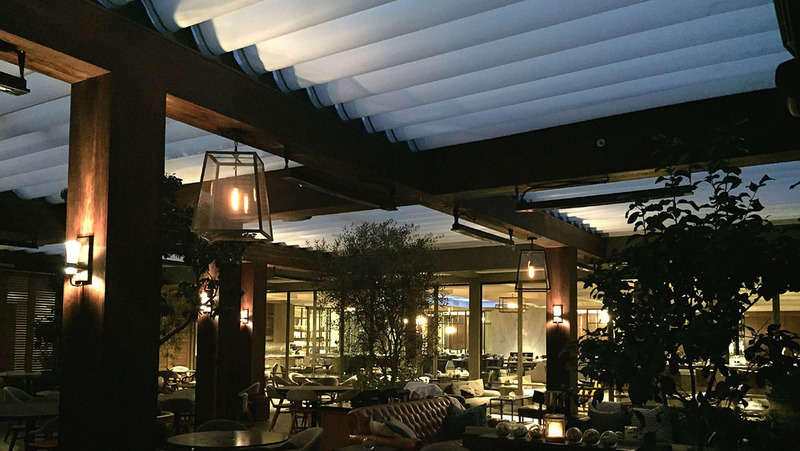 A retractable fabric roof system allows restaurateurs to make the most of their patios, decks, and sidewalk seating by addressing guests’ comfort, increasing the usability of the space, and adding to the restaurant’s branding efforts. We’ve all sat on a restaurant patio, uncomfortably sweltering in the hot sun. Restaurant operators often turn to umbrellas for their first attempt at adding shade protection, but they quickly realize the shortcomings as they watch guests begin the meal in the shade and end in direct sunlight. Plain and simple – as the sun moves across the sky, the shade from umbrellas moves, too. 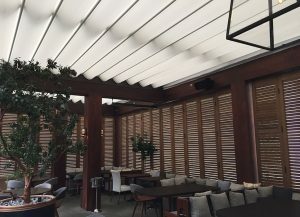 Upgrading to a retractable fabric roof system means your guests can enjoy the ultimate shade protection. No longer will the moving sun mean that some guests will eventually overheat. 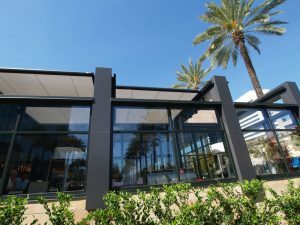 At a push of a button, a retractable fabric roof system glides over the space to create even and reliable shade – something your guests will deeply appreciate. Read more about The Benefits of Commercial Retractable Awnings. Every restaurant operator who offers outdoor seating has looked at the horizon and formulated a plan for the approaching rain clouds. One of the greatest challenges of outdoor dining is, in fact, weather. From hot summer sun to spring showers, fluctuations in weather once meant your valuable outdoor space could only be used in ideal conditions. However, with a retractable fabric roof structure, your guests can enjoy the open-air space more of the time. If rain approaches or the sun becomes too hot, staff can easily (and silently) extend the structure, ensuring that your guests know you’re always looking out for their comfort. Never again have guests waiting in the lobby while tables sit vacant outside. Read more about The Best Retractable Fabric Roof Structures for Spring Rain Showers. While it may be intangible and hard to measure, much of your restaurant’s value comes with its branding. Names, logos, and menu items that become recognizable to customers translate into higher return rates and more word-of-mouth referrals. A retractable fabric roof system gives you another way to stand out and solidify your branding. Using brand colors for your awnings or canopies make your restaurant stand out to passersby on the street, and graphic printing adds valuable signage opportunities. Regardless of which combination you choose, the canvas of your shade structure can add so much to the visual appeal of your building. Read more about Choosing a Commercial Awning to Help You Draw More Business. Is a Retractable Fabric Roof System Right for Your Commercial Property?